LAKEVILLE, IN. 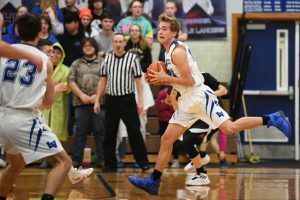 – After a solid Hoosier North Athletic Conference victory at Culver Community January 25, Class 2A #7 LaVille returns home for a Saturday Matinee against non-conference foe West Noble. The Lancers defeated the Cavaliers 79-31 to improve to 13-3 overall. LaVille used balanced scoring as six scored at least eight points. Jared Beehler led the LHS with 17 points, Luke Beehler added 11 and Connor Wieczorek chipped in with 10. West Noble comes in to Dale E. Cox Gymnasium at 7-7 overall, including 3-2 since the first of the year. The Chargers dropped a 62-54 decision at Fairfield. Nick Knepper led WN with 15 points. Josh Franklin had 10, and David Flores, Josh Gross and Drew Miller finished with eight points each. The JV will tip at 1 p.m., with the varsity to follow. The Coaches: Galen Mast (Interim) (5-5 in first year at West Noble). Michael Edison (157-90 in 11th year at LaVille). Last Outing; West Noble lost to Fairfield, 62-54. LaVille defeated Culver Community, 79-31. Series Last 30 Years: LaVille leads, 3-0. Last Meeting: LaVille defeated West Noble, 68-58, February 3, 2018.